With dream vacations at stake, Travel & Hospitality brands are missing the connection with travelers on social media. As one of the world’s biggest industries with almost $7.6 trillion in revenue, Travel & Hospitality has an enormous opportunity to do social exceptionally well. And yet, our study found that while a few brands excel at social media to support and engage travelers, many of them have major strides to make to meet travelers’ expectations. Travel & Hospitality brands are failing to respond to consumers’ posts quickly, which means travelers are left deserted. Travel & Hospitality brands need to learn that Twitter is not the only social channel. The study shows that they are leaving travelers on Facebook, Instagram and other networks stranded. Travelers do not follow brands on social just for beautiful destination pictures. Overall, brands have to do better to engage customers and provide support via social, not just offer education and entertainment content. They need an integrated digital strategy to provide the depth and level of responsiveness that travelers need and expect. 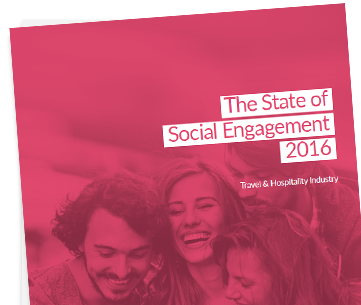 The Travel and Hospitality edition of the State of Social Engagement 2016 rated Travel & Hospitality brands – United, Expedia, Uber, Airbnb, Hilton, Marriott, Hyatt and JetBlue – across online communities as well as five of the most popular social channels used by consumer brands to engage with customers. Find out who is doing social best and learn how you can improve social from the full study results.